Hypo-say what now? What is hypochlorous acid? Hypochlorous acid is nature’s oldest disinfectant, and it happens to be walking around in about 7.5 billion people right now. As in inside all humans, this very moment. Why? It’s the substance your white blood cells produce to fight off infections. It’s also the active ingredient in electrolyzed water, which is an industrial technology used for green cleaning and sanitizing. Electrolyzed water is made when electricity is used to change the chemical structure of salt, water & vinegar into a green cleaner as effective as bleach, but with no harmful chemicals, fumes or residues. Pretty cool, right? How is hypochlorous acid made? Nature’s super powerful disinfectant, and also the ingredient that gives bleach its anti-microbial power. It’s a type of chlorine. 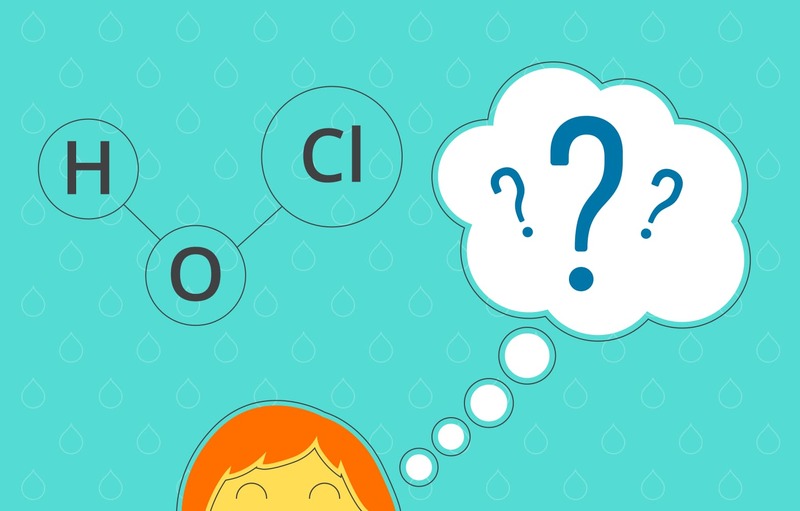 Most people don’t know there are different types of chlorine. Bleach, also known as sodium hypochlorite, has a different chemical structure than hypochlorous acid. Sodium hypochlorite is NaClO, and hypochlorous acid is HOCl. When the pH of the solution is lowered to the correct level, HOCl is created, exactly the same substance that is your immune system’s germ fighter. So when you take your child to that indoor play area/petrie dish – your white blood cells get to work creating hypochlorous acid. A common detergent used at different concentrations in everything from toothpaste to skin moisturizers to cleaning products. Because concentration levels vary so widely across products, so do toxicity levels. Hypochlorous acid is so gentle that it has several uses in the healthcare and medical space. It’s FDA approved for use in wound care and eye care products and is also common in veterinary care products. It’s even used to eradicate biofilm. There has been extensive research on the gentleness and efficacy of HOCl when it comes to killing bacteria. It is so trusted and effective, that hospitals use it as a disinfectant in both the US and Japan. Given how effective it is at killing microbes without leaving behind harmful residues, hypochlorous acid is also used for preserving fresh produce. It’s even USDA approved for use in organic crop production. At Force of Nature, we’ve harnessed the power of hypochlorous acid by miniaturizing the industrial-grade electrolyzed water technology to fit on your countertop. Our small appliance with its patented electrolyzer transforms tap water, plus a capsule of salt, water and vinegar into a powerful multipurpose cleaner, disinfectant and deodorizer that replaces bleach, deodorizers, kitchen, bath, glass and even rug cleaners. Really! It’s just as effective as the top conventional cleaners, but with zero toxic chemicals. Here’s a little video about the science.